Study abroad is an excellent way to become familiar with other cultures and to improve your fluency in Spanish. Penn State faculty members lead summer study abroad programs in Puebla, Mexico (Liberal Arts Program Spotlight) and Ronda, Spain (Liberal Arts Program Spotlight) and in Brazil (for students of Portuguese). Lima, Peru: Cross-cultural Engagement and STEM has just been added as a new study abroad opportunity. Additional summer and semester-length programs are available through the Council on International Education Exchange and other organizations. You can also stop by Education Abroad Resource Room at 412 Boucke Building to speak with a peer adviser. IMPORTANT: Once you have visited the Office of International Programs and collected information about the program(s) that interest you most, make an appointment with a Spanish advisor to discuss your choice. 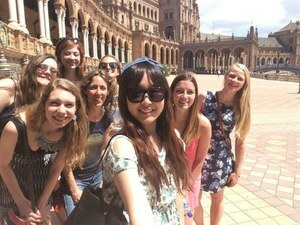 Spanish advisors can help you to determine how courses taken abroad can fit into your academic plan and provide helpful advice for planning to study abroad.